Here is a very interesting app for the Apple iPhone built upon foundations of serendipity. As such it’s not an app that will be easy to port to any other smartphone or mobile platform willy-nilly. The new App is called Cycloramic and its super-duper party trick is to take video panoramas on your iPhone (preferably an iPhone 5). Unlike many other panorama apps it doesn’t need the user to sweep their phone or body in any particular motion, it’s all automatic and powered by the phone’s vibrate function which, as luck would have it, spins the phone at a steady predictable rate about its axis as a video is recorded. You can also see a panorama of Steve Wozniak’s kitchen, as he tried the Cycloramic app for himself a couple of days ago. After testing the app with his iPhone 5, Woz reportedly said “the app was unexpected, fanciful and useful all at the same time”.iPhone 4 users report that the app remains functional but the phone will turn around at about half the speed. Though the app is listed in iTunes as compatible with most other iOS devices; without the flat bottom and the vibration characteristics of the iPhone 5 your experience will probably be “terrible”. If you find yourself wishing to take a panorama shot with the app but can’t find any smooth surface on which to perch your iPhone all you need to do is use an iPad or a large screened smartphone with a spirit level app resting on a jumper, for example. 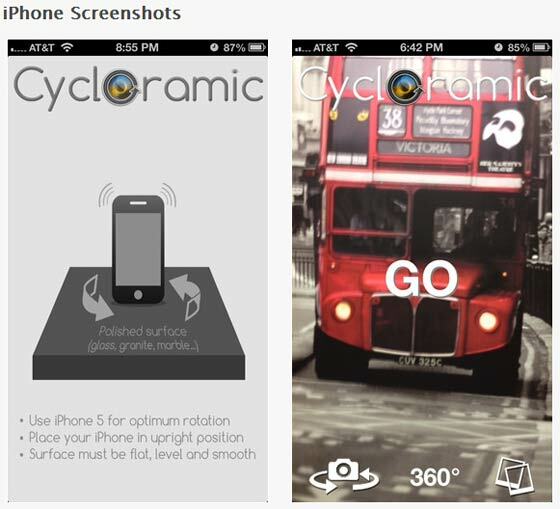 The Telegraph reports that the Cycloramic app was launched just a week ago “by Bruno and Rebecca Francois, an Anglo-French couple who live in the US” known collectively as Egos Ventures. It’s a good example of people imaginatively using a side-effect of a device’s functionality to create unforeseen additional functionality. The only other examples I can think of right now are in the field of music creation where rotating Hammond Organ Leslie speakers got abused and guitar amplifier distortion became a musical feature rather than a problem.